Germany is the unquestioned world leader in renewable energy. By mid-2011, the European nation generated over 20 percent of its electricity from wind and solar power alone, and had created over 400,000 jobs in the industry. The sweet German success is no accident, however, and the following pie chart illustrates the results of a carefully crafted recipe for renewable energy. 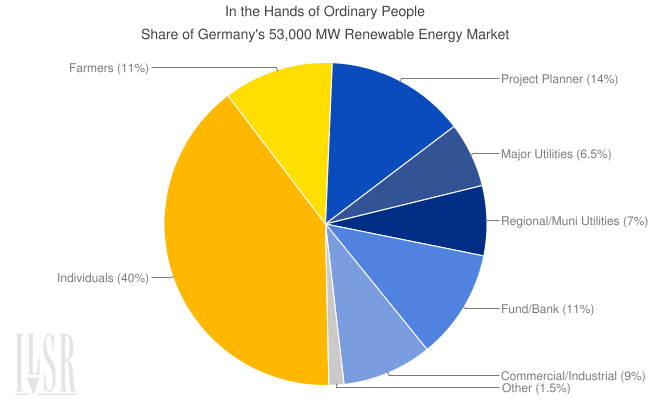 As the chart illustrates, more than half of Germany’s enormous renewable energy generation is in the hands of “ordinary people,” according to the German Renewable Energy Agency. This outcome is more than golden in color, but has been a gold-clad economic opportunity for the German people, who have used the opportunity to become renewable energy producers and improve their economic security in a time of world economic crisis. The policy recipe behind this golden success is called a feed-in tariff and its basis premise is that anyone can become a renewable energy producer. Under a feed-in tariff, electric grid operators are required to buy all renewable electricity under a long-term contract, and to offer a price for the renewable electricity that provides a modest return on investment. The feed-in tariff is responsible for two-thirds of the world’s wind power capacity, and nearly 90 percent of the world’s solar power. The feed-in tariff is Germany’s complete energy policy recipe because it’s an incentive for generating renewable energy, but also has a democratizing effect – broadening the source and ownership of energy production. Crucially, the feed-in tariff builds a political constituency for more renewable energy production in a way that America’s half-baked energy policy does not. The following chart illustrates a recent study of support for more nearby wind power in two German towns, each with a local wind farm. The difference is ownership, with one adjacent wind farm absentee owned and the other locally owned; and the difference is a massive shift in public support for more wind power. (I’ve generalized this to renewable energy). The political importance of democratizing participation in the energy system can be boiled down to a simple example: a residential solar installation may add 3-5 kilowatts of new renewable energy to the grid, but more importantly it adds two new solar voters to the rolls. It may be marginally less cost-effective to allow a broad base of residential solar installations under their clean energy policy, for example, but the Germans have realized that the political payoff far outweighs the fractions of a cent added to electricity bills. In practical terms, it explains why Germans are ahead of their targets for renewable energy production and can consider replacing their entire nuclear power industry with clean power while the United States lags behind, mired in a debate about extending the federal cash grant program and with an energy market balkanized by 50 distinct state policies. The success of Germany’s renewable energy policy, in contrast to America’s, is a case of just desserts. Germany’s policy expands the energy pie and also divides it more evenly among its citizens, resulting in a groundswell of public support for more renewable energy. American energy policy is half baked, and its energy future is less appetizing. The dominant energy policy in the U.S. is federal tax credits, policies that prevents vast swaths of America from being energy producers simply because they lack sufficient tax liability and forcing public institutions like cities and schools into awkward public-private partnerships to access them. The use of the tax code leaves the renewable energy industry heavily reliant on large financial institutions to help them sop up the credits, siphoning off scarce dollars to pad Wall Street accounts and effectively capping the growth of the industry. Marshal Salant, managing director of Citigroup Global Markets Inc., said in a recent interview: “There’s more demand for tax equity to finance renewable energy projects than we will ever have in the way of supply.” And Wall Street banks don’t love clean energy, only money. Unlike citizen energy producers, the banks won’t provide crucial political support when renewable energy policy is before the Congress. Critics that contrast a feed-in tariff with other energy policy options like tax incentives, REC markets, or renewable portfolio standards miss the point. The latter are ingredients in a clean energy future, but the former is a complete recipe for the political, economic, and financial future of the renewable energy industry. Without a similar comprehensive approach in the United States, our energy future may not be so sweet.